2nd LEG - TAIPING Sponsored by Kuala Lumpur Kepong Bhd. LATE ENTRIES SURCHARGE RM 5. The entry form and a copy of pay-in-slip MUST be faxed to 05-2419289. (Not later than Thursday, 8h April 2010). 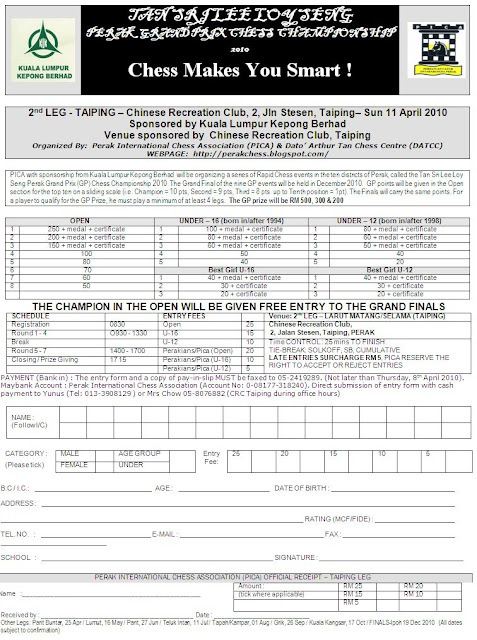 Maybank Account : Perak International Chess Association (Account No: 0-08177-318240). Direct submission of entry form with cash payment to Yunus (Tel: 013-3908129) or Mrs Chow 05-8076882 (CRC Taiping during office hours).